updated, Thursday morning: It's hard not getting your hopes up, but the Academy offered little mercy. Not only did Nightcrawler get one sole nomination (for original screenplay) and with the exception of Best Actress, Gone Girl got completely shut out. 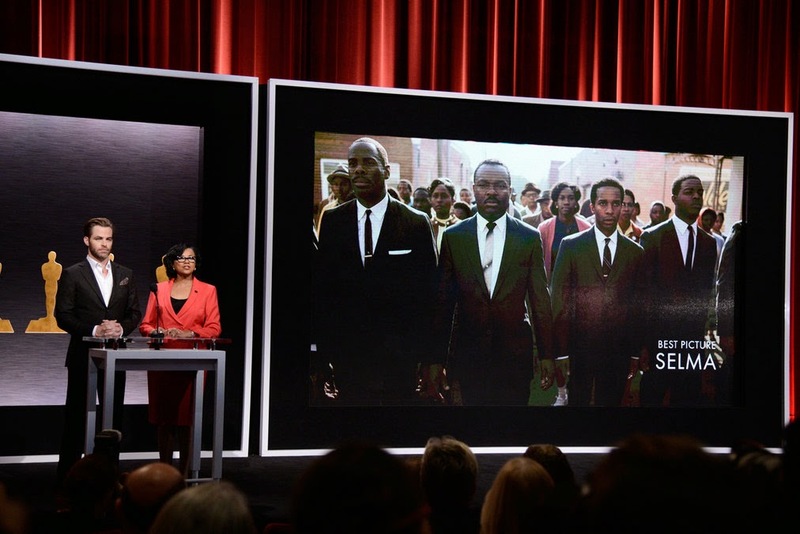 Selma was nominated for Best Picture... and best Song. That's IT. There were major omissions in almost every category: Life Itself in Documentary, Interstellar in Cinematography, Birdman in Editing, Jennifer Aniston in Cake, Jake Gyllenhaal in Nightcrawler, The LEGO Movie in Animated Feature, etc. But there were some interesting surprises such as PT Anderson for adapted screenplay for Inherent Vice (and a surprise costume design nomination too). In one of the biggest shocks Bennett Miller is now the first director to be nominated for Best Director without a coinciding Best Picture nomination since the category expanded to up to 10 nominations. I'd say Boyhood is still looking like the front-runner though the Imitation Game also has the requisite editing and directing nominations (for the record so does Budapest Hotel). See you on Feb 22! 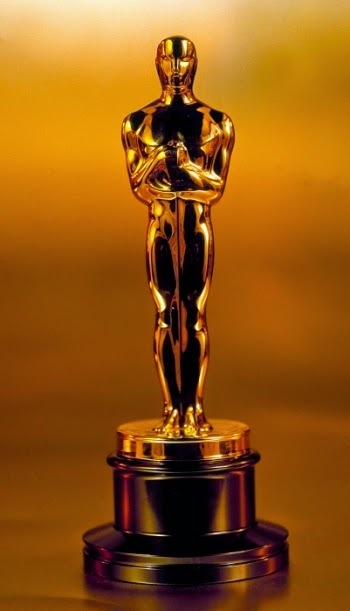 The nominations for the Academy Awards will be announced Thursday morning. I give you my somewhat fearless predictions of who’s names will be called in those wee hours. This is an interesting year in that there are many films that seem to be dominating. There are many sure things, many sort-of-sure-things, and many on the bubble for nominations. One thing’s for sure: there will be lots of surprises. Some categories are stacked and will only lead people to complain about who got left out. And there’s a reason for it: this was an incredible year for great films! Le't get to it! We have a situation where there are 12 films fighting for 10 possible slots. I believe there will definitely be at least nine nominees which is the same number of nominees for the past three years (there can be anywhere between five and ten). Numerical Oscar experts have gone on to say it’s almost impossible for there to be ten nominees so we’ll see what happens. Out of the ten I’ve mentioned above I’d say Nightcrawler, American Sniper, and Gone Girl feel the most vulnerable. If any of the others weren’t nominated I’d be genuinely surprised. The big question mark remains Angelina Jolie’s Unbroken, a film poised, since conception, to be a frontrunner has basically become an also ran. It earned tepid reviews (did they even see it?) though movies with bad reviews have shown up here (here’s looking at you Extremely Loud & Incredibly Close). It has everything Oscar voters want in a Best Picture, so we shall see what happens (and it really could happen). Ditto, Foxcatcher from Bennett Miller, who’s last two previous directorial efforts both reaped Best Picture nods. I still don’t get this whole Selma snub thing. The movie was poised to be a solid Oscar contender. The movie came out very late and the studio only sent screeners to Academy members. It didn’t show up in the guilds AT ALL. I still have a feeling the Academy will want to honor Ava DuVernay who would be the first African American woman to be nominated for Best Director. I’m not 100% sold on the practically unknown Mr. Tyldum though he did get a DGA nod which helps; I can’t imagine The Imitation Game having much of a chance for Best Picture without a directing nod. It’s no Argo. The big question is what curve ball will the Director’s branch throw this year? I going with Damien Chazelle to make it in the “helmer-of-random-indie” slot. Also, never count out a well-respected Clint Eastwood film (would would make history as the oldest Directing nominee). But that’s all beside the point because I think this is Linklater’s to lose. This is one of the tightest Best Actor races in quite some time. Any of these five could win in a given year. The question is whether all of them get in. Jake Gyllenhaal seemed like a sure thing back when his movie was released to great success in October. But then the field got crowded and he seemed like he’d probably be the victim of overcrowding. But then a strange thing happened: he has been nominated in every major precursor award: SAG? Check. Golden Globes? Check. Critic’s Choice? Check. BAFTA? Check. At this point he’s way more of a lock than David Oyelowo who only has a Globe nod to be proud of. And what of Steve Carell? He could very much bump someone out (or perhaps strangely enough, appear in Supporting like at the BAFTAs). Either way any of these guys would deserve to be here. To be honest, I think this five has it locked down. I’d be genuinely shocked if there were any surprises here. I can’t really imagine anyone else besides Adams breaking in, though people like Marion Cotillard, Shailene Woodley, and Hilary Swank have been mentioned previously, I think their chances have come and gone. I really want to believe that Steve Carell would get placed here instead of in Lead but I think it’s sort of crazy talk. If not him I guess Josh Brolin in Inherent Vice, or even Tom Wilkinson in Selma, would make it in though it remains to be seen how many nominations Selma will actually receive. I wouldn’t be completely surprised to find a random supporting player from The Grand Budapest Hotel show up and pull a Jonah Hill. The Oscar prognosticators were thrown for a loop recently when it was announced that Original Screenplay contender Whiplash would be moved to the Adapted category at the Oscars because the film is based on a short film the director made in order to raise funds for the feature film. Therefore something’s getting knocked out because it’s certain to be nominated here. I’d say the final slot comes between Wild and American Sniper. I’m giving Sniper the edge since it’s more of a Best Picture contender than Wild. I’s say it’s race between Selma and Foxcatcher for the fifth slot. I also wouldn’t be surprised to find Mike Leigh nominated here, yet again, for Mr. Turner. The first four seem like guarantees, the big questions remains which of the many weird foreign and/or indie movies make it in. The easy choice is Studio Ghibli’s The Tale of the Princess Kaguya, but since it’s not a guarantee I’m going with GKids’ Song of the Sea. The Documentary category is notorious for its random snubs. I’m talking Blackfish, Project Nim, Grizzly Man, or even The Thin Blue Line, and Hoop Dreams. The snub is usually one of the more well-known popular films, so I wouldn’t be terribly surprised to see something like Life Itself kicked to the curb. My guess however is that The Case Against 8 will be sidelined for the more feel-good music film Keep On Keepin’ On. There is no populist choice this year which makes this category particularly tough to call. It’ll be even tougher in a month trying to figure out which one will eventually win. This feels like the one category that is guaranteed to have Unbroken show up due to the fact that legend Roger Deakins still doesn’t have a freaking Oscar. This category could surprise. Obviously visual wonders like Intersteller could find itself sidelined for quieter work like Gone Girl or The Imitation Game. It remains to be seen how much the Academy is going to go for such a divisive film even if its technical merits are unparalleled. There finally isn’t an obvious British period piece/costume drama that will dominate this category this year. Look for more restrained work in something like Big Eyes to spoil, or even something not very well known like Belle or The Immigrants could be possible. This will be an interested category to look at. I could easily see something like American Sniper showing up especially since it feels wrong not having some kind of war movie in here. Though Clint Eastwood films tend to not do well in this category (only Million Dollar Baby has shown up here since Unforgiven). Nightcrawler would deserve a nod but I’m still wondering how much love it’s gonna get. I’m really curious how many technical nods Guardians of the Galaxy will get. On the surface it’s a really silly movie in a way and I’m not sure how much the Academy will go for it, however deserving it may be. Having said that I could easily see something more beloved sneaking in like The Theory of Everything. Even critical failures tend to make it in these technical categories which bodes well for Maleficient. Heck, if Click or Norbit can be nominated anything can happen. It must be said that Alexandre Desplat (who has yet to win even with 6 previous nods) could possible score THREE more nominations. I still don’t buy that could happen, he’ll very likely end up with just two, or even one. This is a rather tricky category to pick this year as anything can happen with that wacky music branch. I’d love to see a real shocker and have James Newton Howard’s awesome Nightcrawler score show up here, but that’s wishful thinking. I don’t even wanna get into how crazy the Academy’s music branch is. After last year’s controversial situation with that random nomination for a movie no one has ever heard of that was eventually disqualified, anything can happen. All the popular songs you THINK will get nominated actually tend to get snubbed and songs you’ve never heard of make it in. So good look to anyone attempting to guess these right. I’m actually pretty confident in this category. I don’t feel there’s much wiggle room. I could see Maleficent sneaking in, after all ifAlice in Wonderland could WIN this category, Maleficent could easy be nominated. Fun fact, if Big Eyes gets nominated it would unofficially mean it would win as Tim Burton films have a 4 for 4 record in this category. Everyone knows that war and special effects extravaganzas tend to do really well in this category, though three war films feels like overkill to me. So it’ll be interesting to see which war films make it in. Also, most of the previous Transformers films have done well here so I wouldn’t be surprised to see it show up, the sound branch cares more about technical achievement than critical praise. Musicals do well in this category which is why Into the Woods feels like a shoo in here, as are the war films and special effects extravaganza. There’s also lots of cross over with Sound Editing, it’s just a question of which movies will get both nods. There are sometimes some pretty head scratching picks in this category. No one really thought the bomb The Lone Ranger would make it in here which it did. Also, the third Transformers film showed up here back in 2012 so I can’t imagine this fourth installment not making it over more respected films. I still think this one is Interstellar’s to lose.